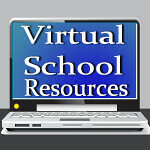 Virtual School Resources: Tweeting is educational? Yes! One of my favorite newsletters about education, ESchoolNews, posted an article today about how Twitter is a great tool for educators. We hear so much about how Twitter is just a waste of time for our teens, how all they do is tweet about what movie they've seen or which Starbucks they are ordering their caramel macchiato from that day. In the article, How Twitter can be used as a powerful educational tool, the authors tell of a recent event in Eqypt where, while President Muburak was speaking, the people of Eqypt were texting about their frustration. Right there in the street, they changed history. The point? Why not engage students by, instead of having them follow the news, having them follow the hashtag #Egypt to really be in the know about that event right then and there. Brilliant. So the next time you are curious about an event, instead of turning on the news, log on to Twitter. Don't have an account? It takes less than a minute. Intimidated? Follow me @kellystilwell and let me know! I'd be happy to walk you through. It's a great resource!